Journey along in a wild forest with me, one full of wild browns. This forest is mostly not on public land. In fact, it is considered trespassing to be here for reasons other than fishing - as is the case with some of the more interesting water I've come across in this state. But fear not, some of the land is public and the water is clean. The fish are spooky but there is a lot of cover to make use of to stay out of their line of site. The tools of the trade are a hand-tied bead-head nymph, a lightweight Keiryu rod, some #3 level line, and just the right mix of sun and clouds. The beautiful wild browns were willing and ready to take a fly on this unseasonably warm almost-winter afternoon. ... and in a stream of this size, there's no need for the longer 360cm rods that are mostly used for Tenkara. The placement of the fly is key as you can easily spook a run or a pool if you can't hook a fish on the first cast or two. Fast reflexes and an astute-eye on the end of the line lead to plenty of hook ups. Even with a few lost on the barbless hooks, plenty of fish were brought to hand. The mini-rod handled it all with ease. These wild beauties brightened my day, and it was worth the long drive and hard work to get to the remote location they call home. I also took a moment to photograph this fine work of art that I've been carrying in my pack recently. The things I saw on this journey were both beautiful and delicate, with the bright red spots of a wiggling trout, and the fiery orange of late-fall fungus, creating a beautiful contrast to the faded colors... of what didn't really feel like an early-winter scene. The light faded and I had some ground to cover to return to the car. One last fish I said, and there it was. It rose from the deep, slamming my fly like a fish easily twice its size. Admirably, the energy of these little wild beauties is often a big surprise. One close-up and then it was over for the day. I returned this little one to its home carefully and quickly, then collapsed my rod to leave. On the way back to the car I walked a dirt road. The caretaker for the private property stopped to see what I was up to. I was happy to see the area being watched and patrolled to help protect it. I asked his name so that I could say hello next time. Respect. This was one of those afternoons to remember fondly... a memory to return to when the cold of the deep winter sets in, when you need some fuel to keep the fire burning inside... before long it will, once again, be spring. Late fall can be a wonderful time to fish in New England. If the winter doesn't set in too quickly, which, this year is clearly not an issue, the fishing can be spectacular. Water is often lower, but the fish are still active and the big ones are moving up into the headwaters and tributaries. Its also a great time to chase some larger fish on wider rivers. Over the last few weeks I've been able to visit the Farmington a few times, the Housatonic, and many other tributaries and small streams. I've continued exploring new water and new access spots, sometimes finding wonderful dirt roads that take you back into slightly less-fished areas. Staying low and moving slow is of the utmost importance as the slower and lower water gives your presence away more easily. Another great aspect of fishing this time of year is the light. Late afternoon right before sunset creates an epic glow of color that often leaves one in awe. Its hard to leave the water when its this beautiful, and packing a headlamp can mean you don't have to stress about hanging out until the last moments of light. Tributaries have been low in the Northeast as we, too, have been in need of rain. But the water is cold, clear and the fish are still there, for the most part. As is this beautiful fall fungus that always stands out strikingly, against the now-duller colors of the pre-winter forest landscape. The red spots on wild browns also create strikingly beautiful contrasts. And yet the colors of the late fall fish remind me that this time of year its not about the numbers but rather the beauty of each individual fish caught and released. A few rainbows make for a fine catch, even if the target fish of the day might have been Salmon. I pause a moment on streams like that to photograph the tools of the day. seeing once again the wonders of nature in different forms. Even a moment when a fallen tree blocking your trail becomes not an obstacle, but a spectacle worthy of appreciation just as it lies, can be had. And then there's the overwhelming emotion of the final trek back to the car, as the sun is low and the fun for the day is over... the air is cold and crisp, the smell of fall is present - yet fading with the light. The thought of soft light, a warm home, friends, family and a hearty meal makes it alright. Please join us if you have any interest. Suntech Tenkarabum Suikei 36 review, Tiger Trout & Happy Thanksgiving! Thanksgiving is a great time of the year. I always have fond memories of spending time with family, drinking great wines, and of course, fishing! This year we haven't gotten much rain to re-fill the streams, so I may end up fishing some bigger water. Meanwhile, I have some catching up to do here, as I've been distracted with work as well as setting up the NYC Tenkara Angler's Club. We launch on December 8th @ Orvis NYC - 7pm for a short intro meeting with wine & pizza. 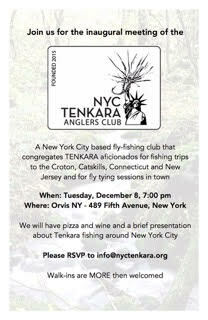 Please join us if you want to learn more about Tenkara and meet some other anglers to fish Tenkara with, locally! Today's update is a bit of a review of the new Tenkarabum Suikei 36 by Suntech & Chris of Tenkarabum, and a jumble of photos from a few trips using it in the last month. This first set of photos is from a stream in PA that I visited with Tenkarabum. He and I were both really psyched to get a chance to fish his new Japanese-made Tenkara rod, the first to be sold here in the US and Japan, designed and built by an American. That's pretty cool! The rod is really fun to cast, and I'd characterize it as a rod designed to throw Tenkara flies (soft hackle kebari, etc) but that also does really well with nymphs. This is a key hole in the market as I see it, because many of the rods we have access to are more clearly designed for fishing one style vs. another, and therefore you notice things lacking when you try to use it across different methods and with different flies. I find many "Tenkara" rods that are really more like Keiryu rods... nymphing-rods that can throw a Kebari. But usually you notice that they aren't as fun when casting a Kebari, mostly due to feel. Then we have a lot of actual Keiryu rods that can also throw a Kebari, but, same problem there. This rod doesn't fall into that category at all, and fishes much closer to my GM Keiryu Special 39 than I had expected. Its a winner, and I particularly like the foam grip. Who'd have thought?! On the other side of the spectrum, we find a lot of really great Tenkara rods, and many Seiryu rods that we can use for Tenkara, that have a much softer feel and a more progressive flex. These true Tenkara & Seiryu rods do a great job at casting Kebari really well and feel amazing in hand - but just don't have the necessary backbone or the ideal flex to guide a weighted nymph in faster water; or to be able to get good hook-sets with these heavier flies in classic Tenkara water. This rod "solves" that problem for me. The following day I got out to fish with Nelson, who is the real motivation behind starting the NYC Tenkara Anglers Club. This was to be our first outing together, and I wanted to take him to a really great small Tenkara stream. Except that on arrival, we discovered there was almost no water. OUCH! We need some rain, badly. We each caught a few creek chub pretty quickly, but where were the usually plentiful Brookies!? Well just as I was about to give up, I cast into the corner of this tiny pool, presenting my fly almost behind the rock to the right. I immediately got a solid hit, and a fish was on. I could see it in the shallow water, and had no idea what it was!? It was fighting harder than a fish of that size normally does, and I was intrigued, to say the least. As I landed the fish, I was extremely shocked to see that it was my first ever Tiger Trout! Talk about luck... these fish are rare! A male Brookie must fertilize the eggs of a female Brown Trout for this to happen. Due to the fact that the Browns usually outcompete the Brookies, this does not happen often. Unlike some photos of these fish that I've seen, this one had a rather brilliant shiny-green/turquoise hue that ran all along the side of the fish. It was one of the most beautiful trout I've ever caught. The Tenkarabum Suikei 36 did a great job landing this fish with ease, but at the same time it made the fight more fun. It is fantastic on the smaller fish, doesn't feel too big for the job, and plays the fish well. At this point, I wanted to make a move to another river, so that we had a chance for some deeper, faster water. We headed towards the Saugatuck, in the hopes that the outlet below the dam would have more water. More water, yes. More fish? No. For some reason, neither of us had a single bite. I imagine it had something to do with the lack of regulations on this section of water... We didn't have much sun left, so we headed downstream to fish a nice catch & release section that at some points holds larger fish, and that neither of us had ever been to. The water was also low here, but enough to hold plenty of fish. I fished the usual fishy looking spots and hooked into one fish which I lost, and then landed a sunfish. Just as the sun was setting, I hit the last section of the little plunges below, to the far side of the river. On the retrieve I hooked into a decent sized Rainbow. The rod also handled this fish quite well. It was a rather fat 11" rainbow that looked like it had been stocked... the fins were plenty beat up. But it had nice color, and I was happy to have landed a larger fish with the rod after small ones all day. Overall I'm extremely happy with the Suntech Tenkarabum Suikei 36, and I recommend it as a very good "all around" rod for Tenkara anglers everywhere. You really can fish it with whatever flies you want, many different weights of line, and for fish of all different sizes. I lost one nice landlocked Salmon that must have been a bit over 12" on the farmington... in fast water. Until that fish worked its way off the barbless hook, I had no trouble guiding it the way I wanted to. I think this rod will surely make it into my quiver on a regular basis.